Peaceful Families Project, Asian & Pacific Islander Institute on Domestic Violence, and Battered Women’s Justice Project, 2012. 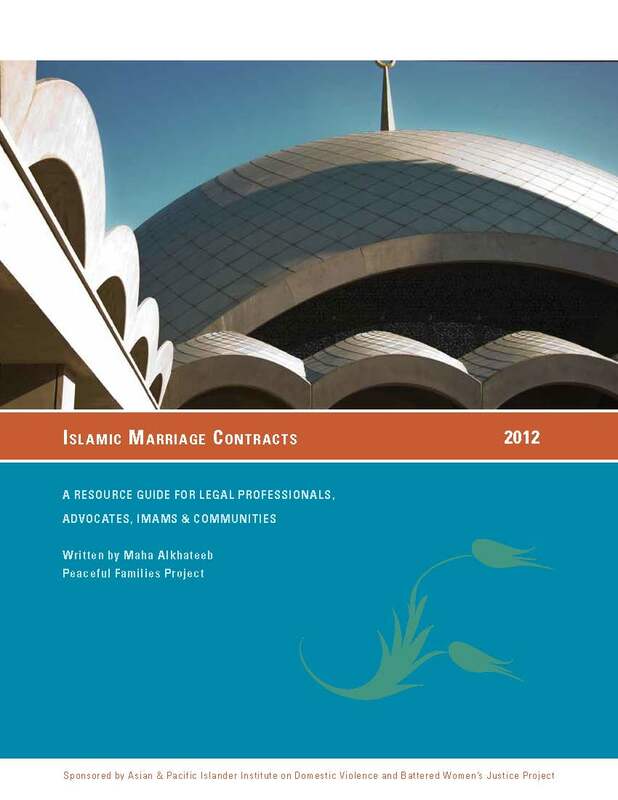 This guide was developed as a resource for legal professionals and advocates working with Muslims, and for Muslim leaders and community members. This resource is meant to provide and clarify information about Islam and gender equality in marriage and divorce, to direct readers to the best practices that safeguard women’s rights and interests, to promote wellbeing and balance for all parties, and to nurture communities. This book is one of the first edited volumes to focus on domestic violence in Muslim families. Bringing the experiences of diverse domestic violence advocates to the table, voices in this text include religious leaders, service providers, and researchers from multiple disciplines. If You or Someone in Your Community Is Experiencing Abuse At Home, There Is Help. By the Peaceful Families Project, 2006. This detailed brochure includes an overview of domestic violence, Islam’s stance against abuse, and tips for victims. Friends, community members, imams, and community leaders are provided with guidelines to help identify abusive situations and offer appropriate support to victims. A resource section highlights Muslim domestic violence organizations, legal support, and national resources. DVD – Garments for One Another: Ending Domestic Violence in Muslim Families (an educational & training program), Co-Produced By FaithTrust Institute and Peaceful Families Project, 2007. 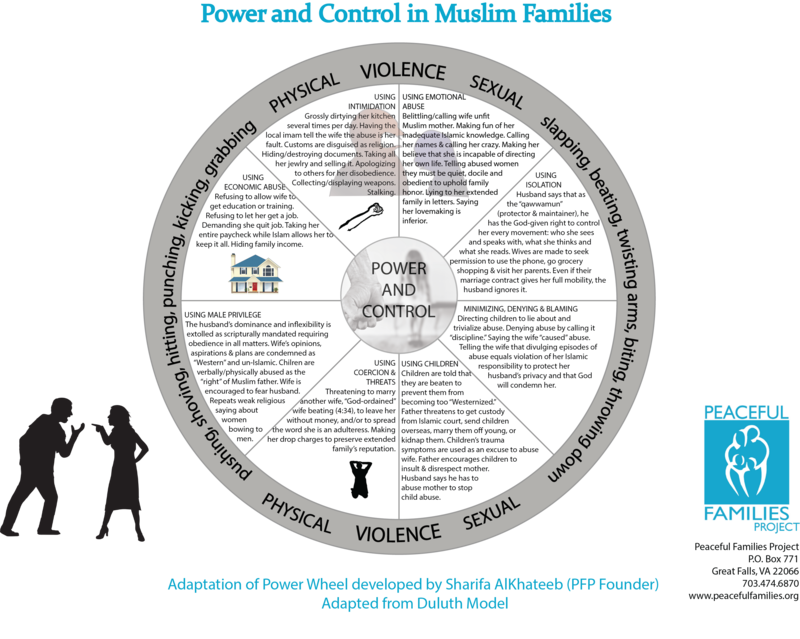 An important resource for mosques, religious leaders, social workers, community groups and shelter staff who offer help to Muslim women currently experiencing violence in their homes. This complete package offers solutions to prevent future violence within the context of the Islamic faith. Includes interviews with survivors, religious leaders, and community advocates. The document offers recommendations on how religious leaders might be able to collaborate with secular counselors in providing support for victims. It discusses suffering, confession, forgiveness, marriage, and parenting from Christian, Muslim, Jewish, and shared faith perspectives. The commentary is a publication of the FaithTrust Institute. Talking points for Imams, Chaplains, & community leaders to give their Friday Sermons discussing this topic. We are looking to put together samples of Khutbah's on this topic, please submit yours if interested!